Gossip Bucket has a new look. Checkout our new app icon and golden bucket logo and experience the new black tie theme. The PhoneFavs website and service will be closing down effective Dec 31st, 2014. At this time we have decided to end of life the product to focus on our mobile app business. Please save or manually export any links or bookmarks you wish to save as they will no longer be available or accessible in 2015. You can keep up with the latest MobileInfocenter news at our website. Politomix is a new political news app for iPhone and iPad. 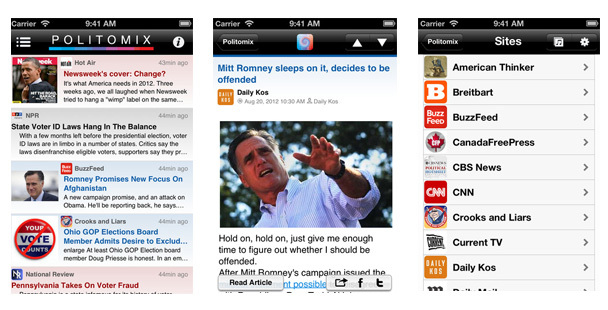 Politomix delivers the day’s US political news to your iDevice in one real time news stream. The app combines, categorizes and delivers the news from all sides of the aisle in one convenient location. Enjoy a curated selection of the latest trending articles and exclusive live stream event coverage. Articles are automatically styled and sorted based on their source’s respective general political leanings. Blue represents left wing progressive media sources, black for traditional mainstream organizations, and red for right wing conservative sources. Readers can swipe and scan the latest news and catch up on what’s currently trending. Easily share, tweet or Facebook your favorites with the tap of a button. Politomix — the political news wire where left, right and center mix. Do you like mobile technology news? The app for that is now available — MobilityBeat for iOS has been released in the App Store. The MobilityBeat app delivers the latest mobile tech headlines around the clock to your iPhone or iPad. Browse the leading sites with a real time news stream. Check it out today. Looking for some cool new apps for you iPhone or iPad? Checkout MobileInfocenter’s apps on the App Store. MobileInfocenter has launched a new photo sharing privacy tool for iOS devices. deGeo is a photo sharing app that removes the built in geotags before posting pictures on the web in order to safeguard your locational privacy. ow iPhone & iPad users can share photos without unwanted locational disclosures. While geotags can be useful for personal reference, automatically including your real-time location along with each photo is probably not the best idea when sharing online. Locational geotag data can potentially disclose some of your most sensitive information including your home address, workplace or daily habits. Unlike the built in iPhone photo application, deGeo removes your geotags before sharing photos. deGeo purposely does not include the geotags and associated EXIF metadata so users can safely share pictures and also save deGeo’d copies back to their own photo album. Available now for iPhone, iPad & iPod Touch. Del.icio.us the longstanding social bookmark service now owned by Yahoo! is due to be shut down soon according to new reports. PhoneFavs started out as an mobile friendly alternative to del.icio.us and is mostly cross compatible with the exiting site and tools and services built for it. Del.icio.us users will find many of the same features for saving, tagging and organizing saved sites on the web. Users can easily import existing del.icio.us bookmarks, tags and links into PhoneFavs. We welcome all former users to enjoy many of the same features in a mobile friendly, access anywhere format on PhonFavs. Update: Del.icio.us may not be shutting down after all, however its future is less than certain at this point. PhoneFavs parent company, MobileInfocenter, has launched its first application for iPhone. Task Banger is a new to do list with a twist. Task Banger makes it super fun to get things done with its built in action sounds and force feedback. Built with ease of use and customization in mind, it supports iOS 4 multitasking, the latest retina displays and works with all iPhone and iPod Touches. Read more here or check it out now on the App Store. A free, iAd supported “lite” version is also available. We also have a video up on YouTube.